Performing a background check is a very sensitive job to do. Hence, you have to be very careful in order to not comprise the safety of the company. Here are some of things you need to find out. First, personal information. Second, social security number and date of birth. Third, current and past landlords. Fourth, employer and job details. Fifth, evictions, broken leases or judgments. Sixth, release of information signature. As a businessman you should be able to know how you are going to protect your business from any negative things that will happen. So, here are the things which you need in order to make sure that you will get the right tenants. First, set your standard. Second, do a pre-screening activity. Third, make an application. Doing these three would make you have a good choice in the process of selecting who your tenants are going to be. There are five steps and ways for you to be able to hire the best employees for your business. First, begin by looking for good people. Second, widen your pool by hiring remote workers. Third, be aware of the right skills set. Fourth, you have to organize staff development. Fifth, motivate your employees by giving them opportunities and perhaps give them bonuses whenver possible. When you are starting up a rental business you need to make sure that you get honest tenants. You should be able to consider the following: First, personality. Second, tenant history. Third, income of tenant. Fourth, credit score. Fifth, legal history. Sixth, work like. All these aspects are necessary for you to find out to be able to determine if you are going to be signing a contract with him or her for your rental business. If you are in-charge in conducting a background check on gun buyers then here’s what you must do. First, a gun customer need to fill out a form containing his personal particulars. Second, the gun retailer then forwards the information to the National Instant Criminal Background Check System. Third, NICS compares that information with millions of records containing the names of people. Fourth, if the sale is approved, the filled out form will be retained in the store. There are significant processes which you need to keep in mind when hiring a new employee. First, you need to validate eligibility and qualifications. Second, you have to rank applications based on predetermined criteria. Third, you have to have the HR manager do the selection and then he or she notifies the HR specialist. Fourth, the hiring manager would check candidates’ references and conducts interview if applicable. There’s a lot more areas which you need to account into in order to be sure that you are doing it the right way. These days even the managers and employers can be background checked via an online resource. So how is it done? It is accomplished by getting the offer, reviewing Linkedin for current and past employees, check social media, find concerns, do court record search and check company websites. These are some of your tools that you can use in doing initial assessment about the organization or entity where you are going to be in. Companies and entities who are now tapping the social media as a resource to conduct background check should know the tips on how to properly do it. There are for areas which you need to go through or consider while doing a search using the social media. They include consistency, transparency, public searches only, timing is everything and then the setup guidelines. Kindly see infographic below for more details. According to a survey conducted, 49% of respondents say that consistency in safety and security is a key benefit of background screening. Also, there is also another finding which tells that 39% of retail respondents integrate screening with an ATS vs. 27% from other industries. 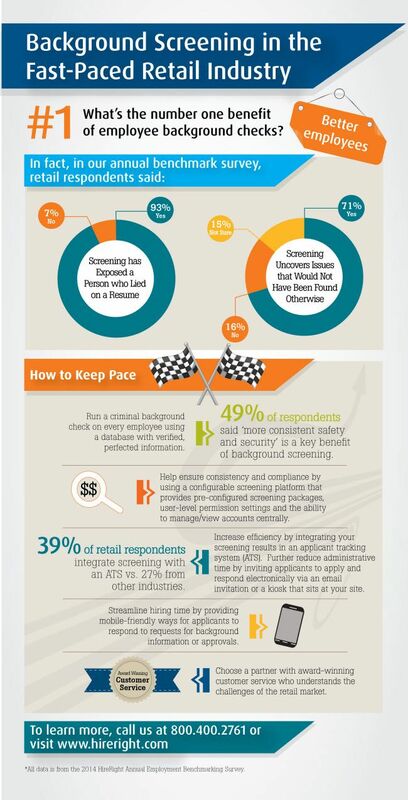 Background checking is a must in order to see to it that security is on top of an organization’s priority. See more data below for your consumption. You can never just trust anyone you barely met right then and there. You have to run a background check so you can be comfortable in doing business with that person or when you are trying to employ someone to work for your company or business. Today, this can be easily performed by going online without the need to go somewhere else. You just have to get the right resource so you can get the right results as well. Visit Background Check Report's profile on Pinterest. © BackgroundCheck-Report.com All Rights Reserved. 2017.